Spring Recipe For Hay Fever Busting Fruit Salad. Fancy making this Hay fever Busting Fruit Salad? 1.) Peel and segment the orange and ½ grapefruit. Cut each segment into 3 pieces. Core the apple and cut into 2cm ‘cubes’. Remove the skin from ¼ of a watermelon and dice into 2cm cubes. Remove the skin of the fresh pineapple and cut into 2cm cubes. 2.) Place the orange, grapefruit, apple and watermelon pieces in a serving bowl. Add the fresh pineapple pieces and a little orange or apple juice, or add the canned pineapple and the pineapple juice. Chill and serve. Surprisingly, the foods we eat can help us ease our hay fever symptoms. Red onions and apples contain high amounts of the natural antihistamine quercetin, which can help reduce hay fever symptoms by blocking the effects of histamines. The best type are red onions, as they have the highest levels. Combine one of these in a sweet and sour or fruit salad with pineapple, as it contains bromelain, which helps the body to absorb quercetin. Other fruit and veg can help too. The attractive, bright orange and red colours of some of our favourite fruit and vegetables signal that they’re rich in beta carotene, vitamin C and a substance called bioflavonoids. These nutrients are said to be good for preparing the body for fighting off hay fever symptoms. So why not tuck into an orange, grapefruit, watermelon, red pepper or carrot and see if you notice a difference? Go for the hottest curry on the menu – or if you’re making your own, go heavy on the spices. Turmeric, an orange-yellow spice, widely used in curries and South Asian cuisine, is believed to reduce inflammation caused by the enzyme phospholipase A2, which is provoked into action by pollen in your system. Recipe courtesy of HayMax.biz makers of the drug-free organic allergen barrier balm for hay fever. 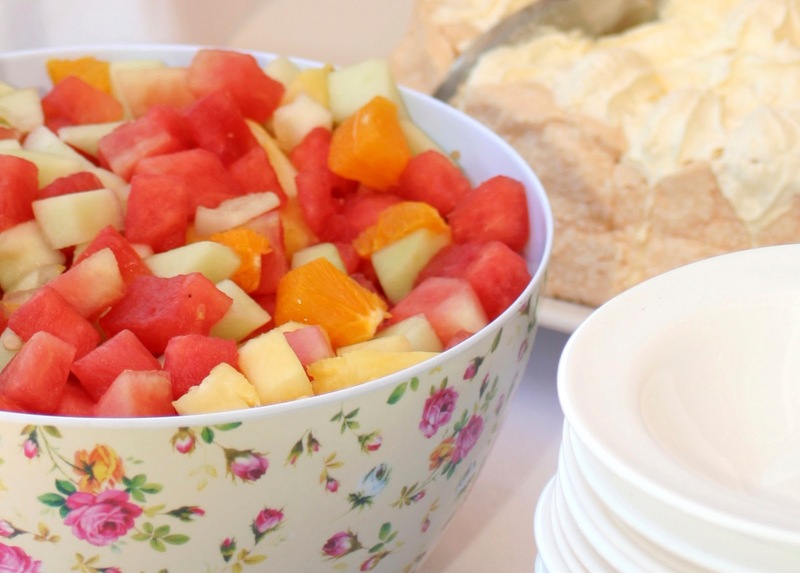 What do you think of this Spring Recipe For Hay Fever Busting Fruit Salad? For more health posts click here: Health. "Sugar-free Date, Almond, Fennel Seed And Banana Brownies"
Looks so fresh and pretty!! :)I would love for you to share this with my Facebook Group for recipes, crafts, tips, and tricks. Thanks for joining Cooking and Crafting with J & J!